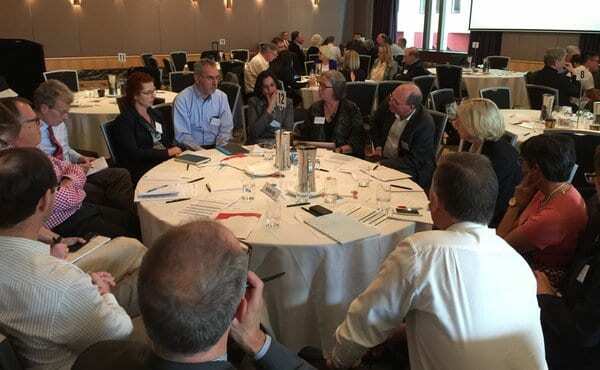 AAHMS Fellows met in Sydney on 29 April 2016 for the Priority Setting Roundtable Symposium to consider a strategy for prioritised research. The event, facilitated by Dr Norman Swan (Australian Broadcasting Corporation), was a resounding success, with enthusiastic participation by more than 100 attendees, including Fellows, Mentees and a broad range of external stakeholders from government, industry, research organisations and community organisations. The Symposium was addressed by Federal Health Minister Hon. Sussan Ley, Chairman of the Australian Medical Research Advisory Board Prof Ian Fraser AC, CEO of the National Health and Medical Research Council Prof Anne Kelso AO, Vice-President of AAHMS Prof Ingrid Scheffer AO and Chairman of Innovation Australia Bill Ferris AC, to outline the current medical research landscape in Australia. Provide a framework to guide selection of target areas for priority based funding. Outline broad principles to guide execution of priority funding by the Medical Research Future Fund and other funding bodies and monitoring of funded projects. Principle 1 outlines an overall driving philosophy that underpins the rest of the principles. Principle 2, 3 and 4 focus on selection of priority areas for funding. Principles 4, 5 and 6 guide selection of specific projects within each priority area and define how these projects work together towards achievement of implementation outcomes. Principles 6, 7, 8, 9 and 10 relate to execution and monitoring of funding and project activities. The introduction of the MRFF should be viewed as a transformational opportunity in translation of health and medical research into outcomes for patients and the community as a whole, holding significant potential to catalyse progress and change in a number of domains. A key component of maximising this unique opportunity is constant evaluation of the value-add that the MRFF can provide over and above the status quo, and this approach should underpin the full spectrum of activities carried out by the MRFF. Priority based research funding should be based on a health outcomes and engagement approach, encompassing a spectrum of health issues, benefits and users. These will be based on community needs, burden of disease, health disparities and impact of preventive/public health activities. In addition to a health outcomes focus, specific consideration should be given to the potential economic impacts of priority areas. This approach is necessary to reflect the realities of constrained research and healthcare budgets. The economic benefits examined will range from cost savings through efficiencies in healthcare delivery, through to creation of new revenue streams via self-sustaining commercial entities. Examples of key performance indicators that may be used include cost assessment of new vs existing approaches, number of successful commercial ventures in the health sector, return on investment metrics and public health based financial metrics together with cost-benefit evaluation of projects supported by the MRFF to be used to refine further investments to generate high value outcomes. Priority should be given to opportunities to build capacity at all levels within the Australian health and medical sciences research domain. Human resource capacity building will aim to develop cohorts of multi-skilled researchers at all levels drawn from a range of high impact domains, provide ongoing skills support and development, and complement existing fellowships and other frameworks. Specific consideration will be given to capacity building opportunities related to infrastructure, platforms and tools that may extend beyond the initially funded project. The key outcome on which project selection and monitoring will be assessed is implementation of healthcare delivery innovations in the selected priority areas. Higher priority will be given to projects with greater potential for widespread implementation, significant potential impact or a high chance of achieving success. Assessment of implementation feasibility will utilise best practice industry style evaluation models, and involve the partners who will be involved in the implementation right from the start. Also important will be de-implementation of ineffective or unproven healthcare practices that form part of current practice. Meaningful consumer input into research should be designed at all stages of MRFF activities. The underlying principles of this consultation are to drive a mature approach to needs analysis and market research, drive invention and prioritisation from an end user/beneficiary perspective, shortcut implementation cycles and maximise outcomes and returns, and capitalise on the existing knowledge, funding and structural systems. Consumer involvement strategy should be carried out in a sophisticated manner that maximizes input while maintaining an evidence-based and balanced focus. Projects selected for support will demonstrate a specific collaborative focus to ensure that the right people with the right skills and networks are in place to give the greatest chance of success. These skills will be multidisciplinary in a meaningfully complementary way, and must include all domains necessary to maximise outcomes e.g. business and project management, engineering, physics, information technology etc. Funding decisions will therefore be agnostic of public/commercial status of applying institutions, and where required skills are not already available within applying bodies, acquisition will be facilitated by the MRFF. Focus on areas of national importance and global significance. A global approach will be taken, looking at international context and evidence base, local scope and cooperation/co-investment opportunities, and global industry status and competition considerations. Utilise a goal and milestone based approach incorporating best practice from public and private research and project management fields. Wherever possible a staged approach that builds in accountability to achieve intended outcomes will be used. Funding for success, including reflecting the true total costs of research activities, incentivising excellence and maintaining flexibility in funding to allow ‘pivoting’ as new opportunities or barriers arise. Maintain a diversified risk/benefit portfolio, including an appetite for potentially disruptive/ innovative or high risk/high potential benefit activities. Additionally, support de-risking early stage ventures with a view to commercialisation. Use of expert review to guide selection, approval and ongoing monitoring of activities. This should be implemented in an industry based manner using a targeted, iterative, staged/gated approach. 1. Process KPIs – these reflect the work of the funding body and will be designed to meet the expectations of the stakeholders. Key examples for consideration may be the number of projects funded, impact of research funded on overall health burden reduction, number of projects achieving predefined milestones, number of projects progressing along commercialisation path, number of new start ups, increased employment and export earnings as a result of funding made. 2. Outcomes KPIs – these reflect the performance of the funded research bodies and should be set as part of the funding, milestone setting and oversight process. Examples may include reduction in disease burden in priority areas, assessment of specific healthcare improvements achieved, and overall economic return on investment of funded projects. Achievement of relevant milestone KPIs should a critical part of ongoing funding decision making through the project cycle. Support the use of new and novel techniques to maximise innovation potential in research funding. Project submission and assessment should utilise an iterative, consultative approach to development of proposals, business cases and funding models, allowing resubmission with peer review when necessary. Research techniques for consideration may include brainstorming sessions, pitching sessions, ‘hackathons’, ‘blue-sky’ days, venture capital sessions. Maximise opportunities to leverage new and novel funding approaches, including philanthropic funding, joint/matched commercial funding should be supported where possible.